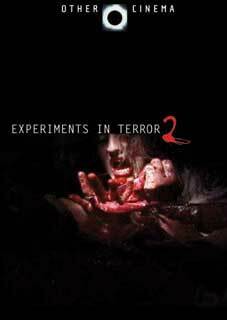 Creeping once more into the darkest corners of the cinematic imaginary, Experiments in Terror 2 unearths a body of ghoulish works to satisfy our most perverse celluloid cravings. Body-parts of cinema past—silents, grindhouse, giallos, Hitchcock, and Karloff—are exhumed, disemboweled, then stitched back together into macabre new creations of frightful power and monstrous beauty through fiendishly clever montage and sinister sound design. Using crazed camerawork, mesmerizing mise-en-scene, and the alchemy of experimental technique, a new generation of cine-spooks apply aesthetic shocks to the rotten corpse of genre convention, re-animating it into a very contemporary order of horror film—graphic, ironic, poetic...undead! The mysterious Closet of Horrors with spirits, psychos, and Bela Lugosi! A chillling cameo from Andy Warhol. Check out the original DVD that began OCD's reign of avant-horror.